13th Annual Supermarket Street Sweep! For five weeks every year, the legal community comes together for one purpose: to end hunger in San Francisco and Marin, where one in four people face hunger. 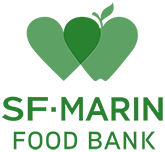 Participating firms and companies enter into a friendly competition to fundraise, contribute the most volunteer hours, and collect the most food for the SF-Marin Food Bank. Over the past 27 years, the Food From The Bar campaign has provided enough food for 19 million meals. Join us May 1st to June 1st to provide 1.5 million more meals.